Tentatively, you slide apart the wooden doors between the hanging paper lanterns, and are met with a warm aromatic smack and a scary roar from behind the counter. The roar makes you want to quietly slide the doors back together again, but actually, it’s a sort of greeting as far as I can make out – probably something like “Welcome – sit down – have a beer – this is your friendly neighbourhood café/bar and every visitor is personally important to us!” Still a bit scary though. But it’s not just us: locals are greeted the same way, and sent on their way with a similar shout. There are three chefs behind the counter, and it’s their greeting. And it is a very friendly place, the izakaya. We’re just here for a beer, really, but looking over the counter we can see the food cooking – and smell it: it’s a split aubergine on the griddle, scooped out and mixed with miso paste, and now the chef’s cracking a quail’s egg into it. “I’ll have one of those, please” – I would say if I could speak more than the shamefully few words of Japanese I’ve learnt. So I just point, look up, spaniel-like, and nod hopefully. 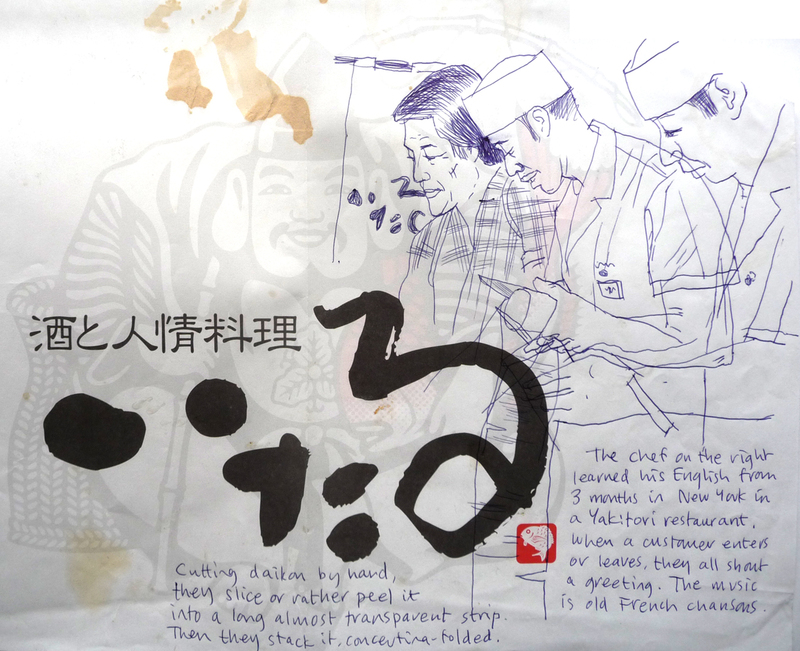 Actually it turns out that the chef speaks good English: he worked in a Yakitori restaurant in New York. In between shuffling the pans and cracking quails’ eggs, the chefs are peeling daicon into long paper-thin strips with their very sharp knives, and it’s folding down, concertina-like, onto the worktop. You could read through it, it’s so thin. I haven’t got my sketch-book with me, so I find a biro and start drawing on the paper place-mat. But dribble quail’s egg onto it. And a bit of miso paste – not to mention the beer.